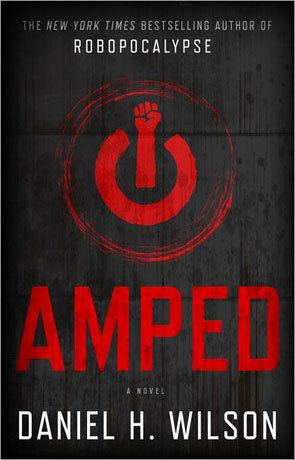 Amped is a near future story that tells of the post-human singularity event, a world where humans are implanted with upgrades that make them capable of super-human feats. Fear of that which is different rears its ugly head and before long a new set of laws is put into place restricting the rights of these "amplified" people. On the very day the first of these laws is passed Owen Gray finds out that his epilepsy preventing implant is actually a top secret and powerful upgrade. Now part of the persecuted underclass known simply as "amps" and recognised by the small jack in their temples he is forced to go on the run, joining a group of similair outcasts who live at an old trailer park in Oklahoma. It's rumoured that among these "amps" is a group who are about to change the world, or destroy it. There have been many stories that cover the theme of persecution over the years while there are an increasing number dealing with post-human biotechnology. However I've not read one before than has managed to combine these two themes in such an effective manner as Wilson does with Amped. There are many other ideas presented here too; much of the novel describes how we deal with technology, asking the question; is it right to implement technology just because we can, does technological advancement mean that these things are inevitable? The novel also manages to feel very current, with technologies instantly recognisable and plausible as near future devices. Like the authors previous novel between each chapter there is a news or information section which manages to add to the overall ambience while also acting like mini info-dumps. Human nature and the fear of the unknown plays a big part in the story, a worryingly realistic reaction in treating those who are different. Personal freedom and human rights is also largely prevalent and this seemingly diminishing right feels all too realistic at times. The authors distinct voice is clear and projects well from the narrative with a tense, sometime dramatic plot and a pretty fast pace. In many ways this story would have been very different if 9/11 and other terrorist activity hadn't happened and it's a sobering thought that the disaster has had such an impact on personal privacy and freedom. There is no doubt that we live in a much closer controlled and surveilled world than we have ever before and as technology continues to outpace society this trend is set to continue. Amped is a powerful novel, at times its quite sobering and it really draws you in right from the start, with some genuinely dramatic and emotive scenes, a thoughtful thriller that manages to hit all the right notes. Written on 29th August 2012 by Ant.